Becoming an instructor for ProTrainings comes with a lot of advantages, including low setup and training fees. Not only can you teach classroom courses, you can also make money as a skill evaluator on blended courses, and even sell e-learning courses to your clients. Earn commission every time one of your students takes an online course — forever! Every day, we receive requests to teach courses that we need help fulfilling. As an instructor, you can choose to receive these job offers over SMS as day-rate work. 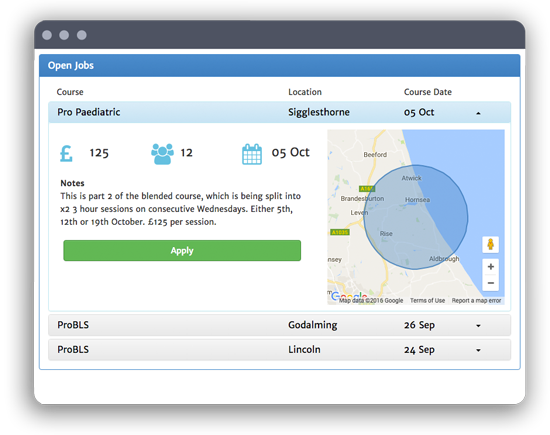 Your courses will be advertised publicly, free of charge, on the ProCourses website to help you fill more courses. You will receive all the training materials you need to teach a course, including powerpoints, manuals and forms. The powerful instructor dashboard lets you track and stay in touch with your students so they come back when it's time to re-certify.